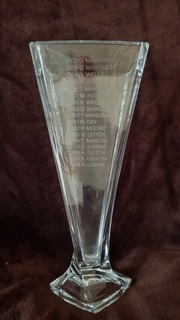 The Mancini Trophy has been a very successful individual golf event over 3 rounds of Stableford golf for more than 16 years. It was started in La Manga and it has been contested in far away places like Myrtle Beach, Antalya (Turkey), Marbella and more recently in Portugal, so for 2019 we are set to return to its roots. 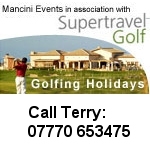 The price for 4 nights, excluding airfares is just £650.00 per person and includes: Shared accommodation, based on twin rooms, daily buffet breakfast and 3 rounds of golf & a 3 course set meal at La Finca on the 7th. The field is limited to 20 golfers only, so if you fancy yourself against some fierce competition, come and join us in Spain. Please contact nikki@mancinievents.co.uk 07702 568607 to reserve your place or for further information.